Please feel free to explore this site to gain a better understanding of our firm and how we help our clients plan for and meet their financial goals. If you have come looking for an investment professional to help manage your company`s retirement or pension plans, you have come to the right place. If you are a successful individual looking for a financial representative, you too are in the right place. The Fowler Financial Group`s purpose is to assist creating and preserving well being for both businesses and individuals. After talking to us, you will know you have been heard. We begin by determining your financial and personal goals. We will create a plan tailored to help you achieve your goals. Money management is not an easy process. Effective money management involves two important components: managing your investments and preserving your wealth. Our goal is to create financial strategies and provide an extraordinary amount of personal service. We invite you to use the Contact tools on the left-hand menu to ask any questions. Let us know if there is any other information you would like to see on this site. Thanks for stopping in. We appreciate your visit. 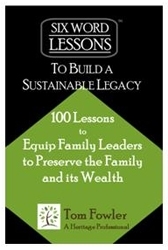 Six Word Lessons - Learn how to create a legacy that impacts future generations of your family! Some families are successful in creating and sustaining their family legacies. Equipping future family leaders to keep the family and its wealth together into future generations starts with this book. 8 Crucial Questions - This booklet is for every owner of a closely held or family owned business. 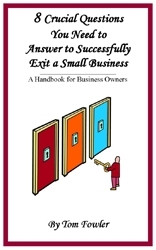 This booklet can help you to ask and to answer the right questions to ensure you exit your business on your own terms, not someone else's. To order book click on image. Our firm was founded with the goal of assisting our clients in every aspect of their financial lives. We work closely with each client to help them achieve their goals. Tom Fowler is President of The Fowler Financial Group and has over thirty years experience assisting owners of closely held corporations in business and estate planning. *Securities and Investment Advisory Services offered through Woodbury Financial Services, Inc., Member FINRA, SIPC and Registered Investment Advisor. Insurance Services offered through Fowler Financial Services Inc. which is not affiliated with Woodbury Financial Services Inc.